Derry City snatched defeat from the jaws of victory with two late Cork goals denting the Candystripes' charge in the Airtricity Premier Division. Kenny Shiels' side led at Turner's Cross through Niclas Vemmelund's first goal for the club after 54 minutes. Cork rallied in the last quarter and equalised through sub Danny Morrissey's header in the 84th minute. Derry were sunk by another set-piece header, Kenny Browne climbing highest to score the winner in stoppage time. Aaron McEneff cleared Karl Sheppard's shot off the line after 16 minutes while Sean Maguire and Gavan Holohan also went close to breaking the deadlock for Cork. Derry almost took the lead on 37 minutes through Danish defender Vemmelmund, whose curling shot was brilliantly tipped round the post by Mark McNulty. Shiels' Danish import did find the net after the break, tucking home Barry McNamee's corner from close range. 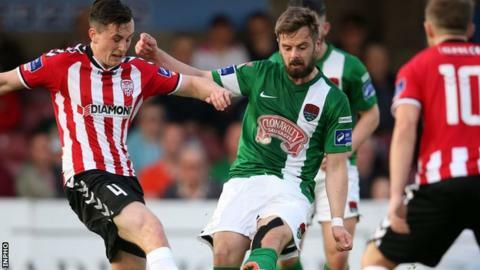 Visiting skipper Ryan McBride made an excellent last ditch tackle to prevent Maguire from scoring, and Derry looked set to hang on for their third win over of the season over Cork. However the home team equalised with six minutes remaining when Morrissey headed home Greg Bolger's free-kick. Browne headed home a corner in the first minute of stoppage time to leave Derry in third place, 10 points behind leaders Dundalk.